On March 16, 1999, Sony invited players to venture into the world of Norrath for the first time. EverQuest has been changing lives ever since, including mine. I'm not just talking about my bout of addiction, which I chronicled on Kotaku years ago. 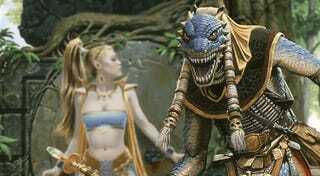 The original EverQuest changed the way I interacted with people. By giving me a well-defined role to play, the game made me feel like an important part of any adventuring party, which did wonders for my confidence and self-esteem. During my time with the game I met hundreds of amazing people. I made good friends and not a few lovers (virtual and physical). My guild was my family, our chat channel the little house with the white picket fence on an endless avenue filled with similar structures — a virtual community like I'd never experienced before. The original game led to EverQuest Online Adventures for the PlayStation 2, a time-displaced sequel in EverQuest 2, a couple of amazing action role-playing games in the Champions of Norrath series, and finally a re-imagining in the upcoming EverQuest Next. Still the original game runs, a monument to a magical experience no game since has been able to recapture. ...as well as an infographic that makes me feel incredibly old. Thanks for the memories, EverQuest. May incredibly odd people frightened of change continue to play you for another 15 years.